Phishing is a major problem because there really is no patch for human stupidity. I’m at an editors conference (editors’ conference) this week, so the new-to-me word this week is sort of thematically appropriate. The term is rogeting, which refers to a way to plagiarize a document: you swap all the substantive words out for synonyms. The idea is that your rogeted paper says the same thing as the original, but in a different way. The real idea is to fool plagiarism checkers, which work primarily by looking for exact matches of text in a document. Students have always appreciated the, um, benefits of plagiarism. But apparently there is some way to profit (don’t ask me how) by republishing academic papers. However, since exact copies of the papers are relatively easy to find, the plagiarizer rogets the text of a paper authored by someone else. If they do this using a software tool, the result can be particularly clumsy; it was from a discussion of one such example where I learned about the term. 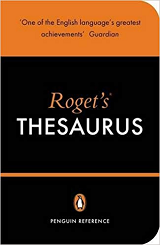 The verb to roget of course comes from Peter Mark Roget, the inventor of the thesaurus. The noun Roget is a synonym for a thesaurus, at least in countries where the name Roget is not trademarked (like the UK, apparently). It’s a nice leap to verbize to roget, especially since the alternatives—to synonymize, to thesaurusize—are sort of awkward. I tie this to the Editor Fest because I occasionally find myself hunting suspected instances of, um, borrowing in documents that I edit. This usually turns out to be either legit (the author copied text from elsewhere in the company) or a misunderstanding about what an author is allowed to copy (authors sometimes think that copying someone else’s text is exactly the right thing to do). I don’t run a plagiarism checker, but even if I did, if a determined author rogeted their text, the software might miss the copy. Let’s turn to fun origins. Since we’re on the topic of editing, where does edit/editing/editor come from, anyway? The not-surprising part is that it comes from Latin, without (as far as I can tell) any stops in Romance languages along the way. The more surprising part is that to edit originally meant “to publish.” The roots are ex (“out”) and dare (“to give,” related to Spanish dar). From that verb the term editor evolved, but keeping the sense of one who publishes. We still see this in titles like editor-in-chief as the person who’s overall in charge of publishing a newspaper, magazine, etc. But the sense of “one who publishes” grew to encompass the tasks associated with preparing something for publishing. Different people took on different aspects of this preparation; the conference I’m at is specifically for copy editors, which is to say, editors who prepare the actual copy (text). Anyway, the job title of editor generated a new sense of to edit via the magic of back-formation, and we got the verb to edit in the sense of preparing text. This sense was extended to other media, so that someone can edit film or video or photos. With that, it’s time to edit this post, in all senses.